Luxury Adventures are conducting a series of interviews with some of our key suppliers looking at the different aspects of their lives and how these influence the experiences they offer. 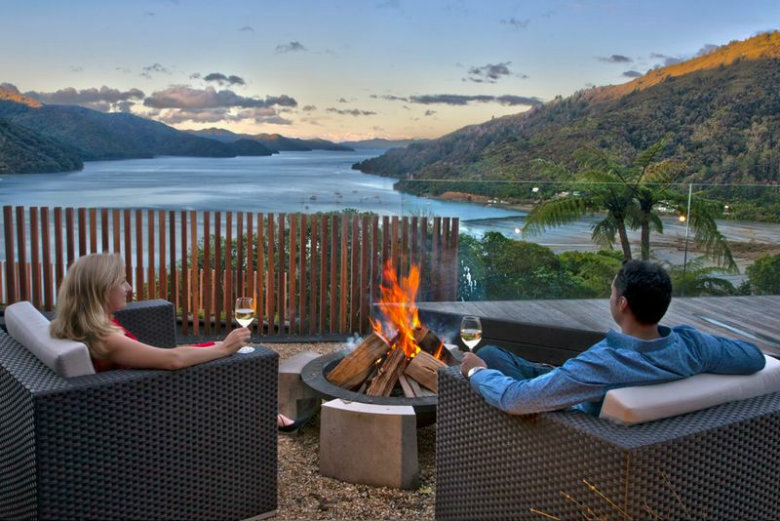 The Sounds Retreat are located in the Marlborough Sounds, top of the South Island, New Zealand. What was your motivation for opening The Sounds Retreat? There were many motivating factors but mainly it was the desire to put into practice what we had learnt traveling the world. We often traveled with our young son and would always look for accommodation that not only offered first class services but also exclusivity as we didn’t want to to feel our child was bothering other guests. In New Zealand we found it quite hard to find the right combination, especially in Marlborough. When we left Japan after the Tsunami and came to New Zealand we decided to try and fill that niche product and set about developing The Sounds Retreat. After living overseas for so long why choose New Zealand and particularly the Marlborough Sounds to settle? My brother had been living in NZ for a few years and we regularly visited him here. During SARS when we were living in Hong Kong we made the decision to purchase property in NZ because of it’s clean, safe environment. It was quite by accident that we stumbled upon the current location near Picton though. 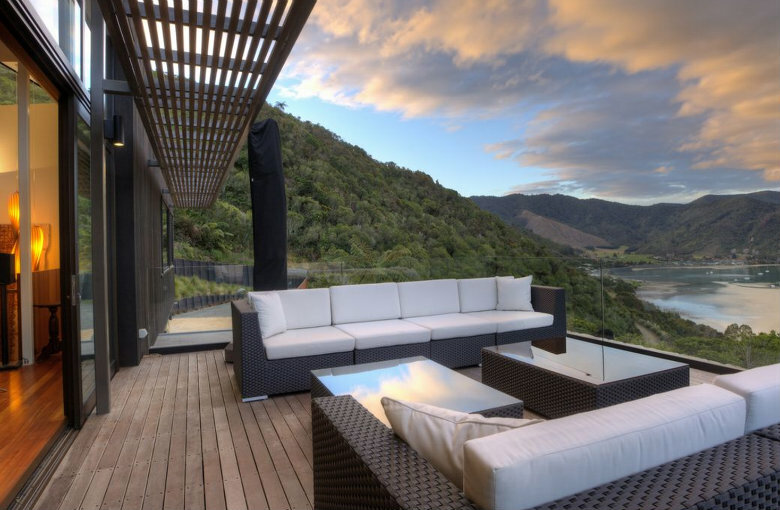 We were driving along the Queen Charlotte Drive and saw the section for sale, the view was so captivating that we immediately fell in love with it and made an offer straight away. Then it was just a question of finding an architect and builder. Whats different about staying at The Sounds Retreat over other Marlborough based properties? As we only have one suite, guests have exclusive use of all the facilities. This is especially important for VIPs, families with young children or a couple looking for total exclusivity. We have full road access too and the guests can use the complimentary Mini Convertible to tour the area. We’ve sent a few guest to The Sounds Retreat now and have received excellent feedback. Are you constantly changing your offerings or do you feel you’ve now found the magic formula and are sticking to it? We’re always looking at how we can improve and take every guest comment seriously and try to act on it as quickly as possible. It’s also important to evolve with current demands and try to predict future ones too. This means always tweaking the packages and products to make sure guests always receive an up to date experience. What type of guest to you think is ideally suited to staying and experiencing the Sounds Retreat? Without question those looking for anonymity and exclusive luxury. Talk me through the cuisine you serve there and the philosophy behind it? We approached a local restauranteur who owned a successful vineyard restaurant to help us design our menus based on personal favourites and local fresh produce. There is a big emphasis on traditional NZ cuisine but with a little “spicy flare” given our love of Indian and Asian cuisine. Bespoke menus are presented to the guests each day based on their dietary requirements. What are the key experiences that you recommend in the Marlborough region? Whats not to miss? Where do I start? My personal must dos are cruising the sounds by boat, visiting the vineyards, private scenic flight, cycling the Queen Charlotte Track, dolphin watching and dining at one of the vineyard restaurants. There are many excellent wineries on your doorstep and I understand you vsit them semi regularly – with that in mind which 5 Marlborough/Blenheim wineries would you recommend and why? In no particular order: Herzogs for the superb Spirit of Marlborough and finest dining in Marlborough, Wairau River for a great lunch in the garden, Saint Clair for the most amazing Sauvignon Blancs, Wither Hills for a great lunch and obviously Cloudy Bay because they put NZ wine on the global stage. What encapsulates the Sounds Retreat experience? Explain to our guests what they will find and remember from their stay at the retreat? It would have to be the sense of feeling pampered from the mount they arrive. From the spectacular suite to the cabana, gymnasium, cuisine, wine and spa, I’m certain that all guests remember the exclusivity, peaceful environment and luxury setting but the one main memory everyone has is of the breathtaking views. Aside from The Marlborough/Nelson region what other areas of New Zealand do you consider as must see and why? There are so many fantastic places to visit, it’s almost impossible to name the must see ones. For a stunning backdrop and fun experience I love Queenstown and Wanaka and would make them a must see. A couple of nights in Wellington for the culture, bars and restaurants. The Bay of Islands for beautiful beaches and townships. The coromandel peninsula for the stunning scenery and natural hot springs. Having the Queen Charlotte track on your back door step is a real bonus. Ive mountain biked the entire track and walked portions and personally consider it one of the finest walks in New Zealand alongside the Routeburn. Can guests access it easily from your property and which portion would you recommend for a day excursion? We’re just a couple of minutes drive from the track at the Anakiwa end and guests can easily walk to cycle there. I would recommend taking a water taxi from Anakiwa to Torea Bay and cycling to Davies Bay and then swapping the bike for a kayak back to Anakiwa. 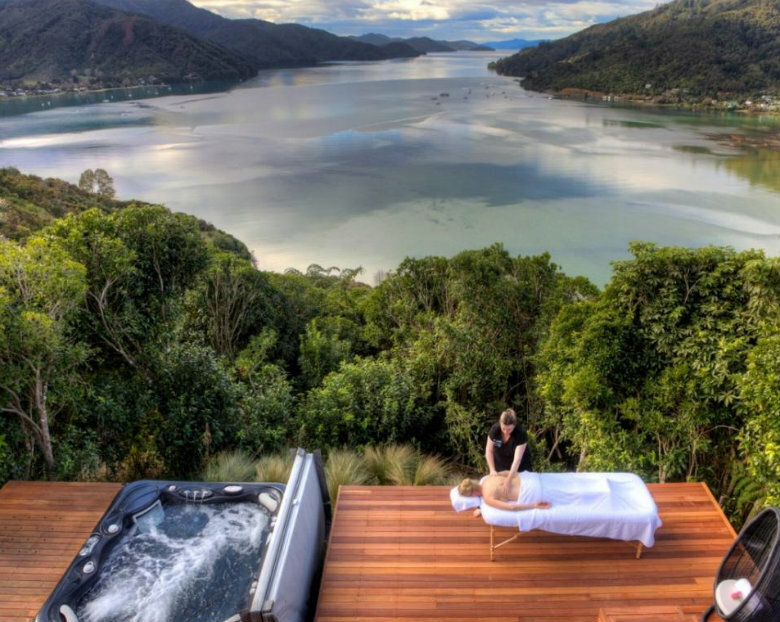 Anne & Tony Brooker are the owners of The Sounds Retreat, Marlborough Sounds.